Go for an outfit that allows you to chill and relax this sunny season. Nothing says summer than a relaxed, laid-back outfit. This week, we're showing you the many different ways you can wear your romper with your favorite flats. Whether you're the girly-girl, the tomboy, or the sporty lass, there's a style equation that will fit your personal style. Just browse through some of the examples below and get ideas on how to wear this style combo! A plain black romper gets its summer touch with a straw bag and espadrilles. Tie a cute scarf around your neck for a vintage touch. Can't seem to let go of your white sneaker obsession? We can't blame you! Pair it with a romper plus your trusty denim jacket tied at the waist—handy for when you're in a super cold airconditioned room! A striped romper, a basket weave tote, and a matching hat make for the perfect summer outfit. Don't forget to slip on your comfiest sandals. If your romper has a busy print, make sure to keep your accessories in the same color family to keep your look from going OTT. We love the bright red sling and white gladiator sandals that go perfectly with the bohemian printed romper. Lace + white = another combination that totally screams summer! Rock this look with that new tan from your recent beach trip. 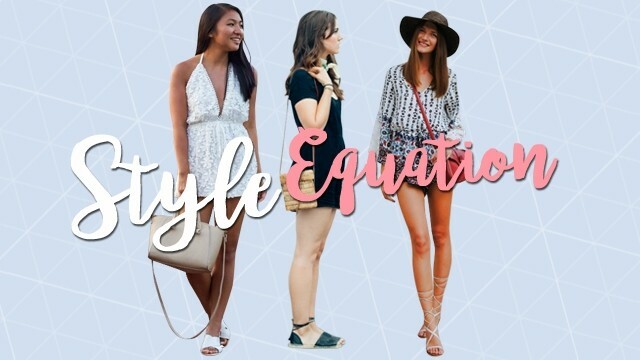 What other style equations do you need help with? Leave us a message and we'll try our best to help!